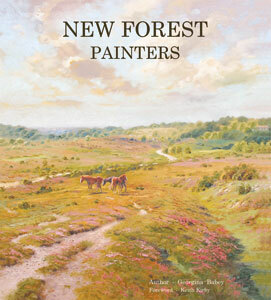 The artists are all members of the New Forest Painters Group, founded in 1997. The selection of paintings within the book have been chosen to convey the wonderful diversity of wildlife and habitat within the New Forest boundaries. The author Georgina Babey was born and brought up in the New Forest and in this book the paintings range from native ponies grazing in their natural habitat and open heath such as Latchmore Bottom to pigs grubbing for acorns outside the Royal Oak at Fritham. Woodland management is explained with paintings of tree felling and the annual pony drift and the Beaulieu Road Pony sales are brought to life. An exceptional book….beautifully presented and informative…celebrates all that the New Forest has to offer.